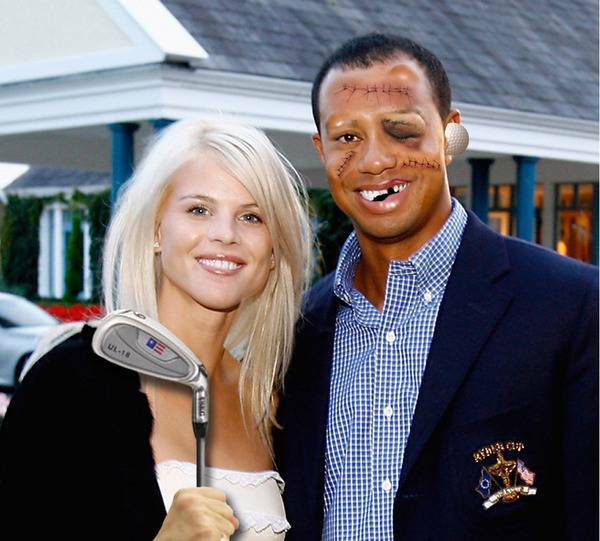 Happy Holidays From Tiger Woods! I received a Christmas card from Tiger Woods yesterday! Just kiddin’, actually received it from Mark over at Northern California Trout and immediately knew I had to send it along to all my BlogBuddies and readers. Tee Hee! I had planned on the day being cool. I had insured that my gear bag had all the warm goodies for this time of year. Warm hat, gloves, socks, fleece hoodies, and waterproof boots were loaded for a day in the November elements. What I didn’t expect was the fresh snow as I looked out my window. That is fresh snow and snowing currently. Oh well, we had planned for this day so some snow wasn’t going to keep us from our destination. Carefully I steered my ol’ jeep over and picked up my son at his house, and, met my son-in-law and grandson in their truck there also. We were offer to challenge the Rainbow Trout of Chesterfield Reservoir one last time before the lake began to ice up. The interstate highway wasn’t to bad and eventually we made our destination. 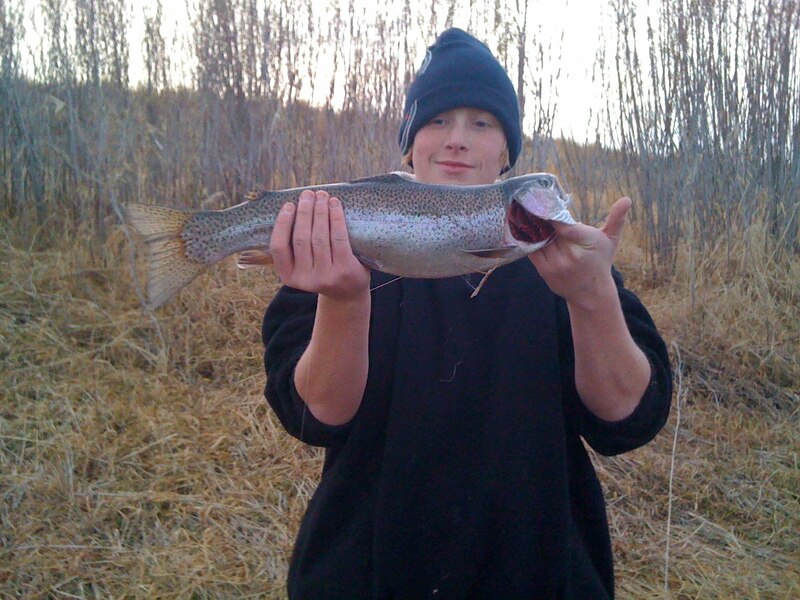 Chesterfield Reservoir is a fine trout fishery located out of Bancroft, Idaho. It’s history provides many stories of some fast growing Rainbow Trout and even a decent Brown Trout on occasion. When Chesterfield has a good water year and not effected by draw down the fishing can be very good. When we don’t have a good water year and the reservoir is effected by severe drawn down by the farmers, then the fishing can be more difficult. Chesterfield has also had a history of the need to be eradicated when the chub and other unwanted fish population becomes a problem. 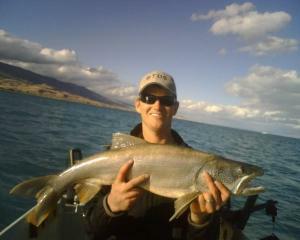 When it is right and Chesterfield is “on”, this lake may be one of the very best trout fisheries in all of Idaho. Most of my fishing experience on Chesterfield has been from a boat. Today, however, because of the expected cooler weather we had chosen not to bring the boat. Actually, the hunter’s in my group had left a camp trailer at deer camp and we needed to bring the trailer home with us. So we had planned for a day of bank fishing thinking some good trout could be found near shore. We started off fishing off the face of the dam. Cold wind blew in our face making comfort a problem, but, remember we had all prepared for the cold elements. Nothing was happening near the dam as a lot of debris was being blown directly into the face of the dam making retrieving lures or bait troublesome. We decided to move over to the bays on one side of the reservoir hoping to get out of the wind, or, at least as much wind as we had near the dam. We found a nice protected area along the shore that had a high brush line that protected us from the wind. I spent some time casting Rapala lures and jigs, but, to no avail. I finally decided I might as well try something else and set up my rod with a Salmon Egg power bait, slip sinker, and some shot. Today wasn’t to be my day, but, I sure enjoyed being outdoors and on the water again before ice fishing season starts. My grandson, Kaleb, and my son, Matt, were the lucky anglers for the day. Two big wonderful Rainbow Trout had visited their baited lines. Unfortunately, one of the big ‘bows came off just as we were reaching for the net. Sorry no pictures for that one, but, it was a splendid Rainbow. 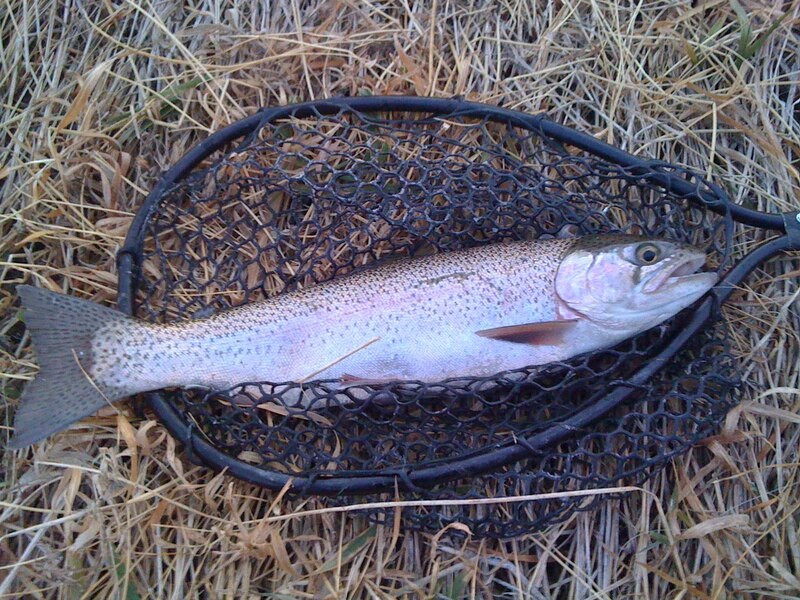 Not long after this beautiful Rainbow Trout was hooked and this time netted with pleasure. This is my grandson, Kaleb, with the prize of the day. Catching A Trout That Is Older Than You Are! Ok, what are the chances when your out on the water that you end up catching a fish that is older than you are? Probably, very improbable. However, as Brett Prettyman writes in the Salt Lake Tribune, it can be done! I would like to thank Brett for sharing this story with us here at Idaho Fishin’ Talk. Take a look at this! Anglers usually describe the fish they catch by length, weight or numbers, but Jacob Brewer of Layton found a new way after landing a lake trout at Bear Lake last week: age. Brewer caught the trout, which was 33 inches long and about 9 or 10 pounds, during a fishing trip to northern Utah on Nov. 7. When he got the fish to the boat he noticed an orange tag with the number 0275 stuck in the dorsal fin. Brewer recorded the number and color of the tag, took a photo with the fish and then put it back in the lake. Returning home, Brewer contacted Scott Tolentino, the Utah Division of Wildlife Resources’ Bear Lake Project leader. Upon hearing that the fish sported an orange tag, Tolentino immediately knew it was an older fish, but when he saw the picture he knew it was truly an old-timer. Tolentino checked records and discovered the fish received the tag, by Tolentino himself, after being caught in a gill net in September 1993. So the fish was at least 16 years old. But that old lake trout was about to get even older. and adipose fin clipped off. Wildlife officials only used those exact clippings on one age class of fish, which was hatched in 1972 and placed into the lake in 1973. The fish Brewer caught was more than 37 years old, Tolentino said, 11 years older than the angler who caught it. Tolentino said it is common for lake trout in Bear Lake to reach ages over 25 due to the cold water and low food supply. The lake trout, cutthroat trout and whitefish in Bear Lake grow slowly as a result. Tagged fish are common in Bear Lake. Tolentino said biologists from Utah and Idaho — the lake lies in both states –use the tags to track survival and movement of the fish. Had Brewer kept the tag from his fish, Idaho Fish and Game would have owed him $5. Fisheries officials from that state initiated a program in the mid-1990s that rewarded anglers for turning in tags in hopes of gaining more information. The program was eventually shelved. An 11-year-old boy killed a bear at point-blank range last Wednesday night after it wouldn’t leave his family’s porch. The boy was at home with his younger sisters and after seeing the bear on the front porch and not being able to get it to leave, the boy retrieved a gun and killed the animal. Fish and Game Conservation Officer Doug Peterson said the black bear had been a problem in the area near the county transfer station, and he and Fish and Game Officer Lauren Wednt had set up a trap earlier in the week. “The bear had been hanging around and we got multiple complaint calls,” said Wendt. The bear had been getting into garbage cans and bird feeders in the area. The Interstate Wildlife Violator Compact is an agreement that recognizes suspension of hunting, fishing, and trapping licenses in member states. This means that illegal activities in one state can affect a person’s hunting or fishing privileges in all participating states. Any person whose license privileges or rights are suspended in a member state may also be suspended in Idaho. If a person’s hunting, fishing, or trapping rights are suspended in Idaho, they may be suspended in member states as well. This cooperative interstate effort will enhance the Division of Wildlife’s ability to protect and manage our wildlife resources. The Interstate Wildlife Violator Compact also establishes a process whereby wildlife law violations by a non-resident from a member state are handled as if the person were a resident, meaning they can be served a ticket rather than being arrested, booked, and bonded. This process is a convenience for hunters, fishermen, and trappers of member states, and increases efficiency of Wildlife Officers by allowing more time for enforcement duties rather than violator processing procedures. If a person plans to hunt, fish, or trap in another state, and they have a license suspension in Idaho, it is their responsibility to contact the other state to see if they can legally hunt, fish, or trap there. Writing from my Blog Cabin about fishing the waters of Eastern Idaho for whatever is pulling on the end of my line! “I don’t want anyone to hold my hand. I want to unchain my soul. I don’t want to lean on anyone. I am getting much to old for that. No contracts or promises here, just my own self made security. If I write something poorly on my blog or offend someone, I am man enough to accept that. As I write for this blog, I will hold my head up high and keep my eyes and ears open to the outdoor view and to the voices that relate to me.